Julia’s Review: Paper Things | What is ML Reading? 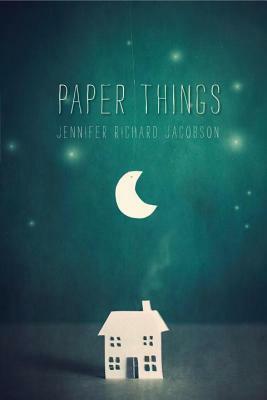 This spring, I posted about Paper Things by Jennifer Richard Jacobson. Recently, my expert reviewer, Julia wrote the following review. Julia is a rising seventh grader. The book made me feel. . . sorry for Ari because she had lost so much and was very lost in the world. I was confused by why they had left home. Favorite character: Daniel. He was so funny and kind and made Ari feel much better. Favorite part: When they organized Crazy Hat Day and got the school traditions back. This entry was posted in Julia's Reviews, Middle Grade Fiction, Uncategorized and tagged Jennifer Richard Jacobson, Julia's Reviews, Paper Things by mlreads. Bookmark the permalink. I enjoyed your review, Julia. That sounds like a very interesting and very different kind of book.